Samantha’s law practice is restricted to civil litigation with an emphasis on insurance, commercial, employment and personal injury law. 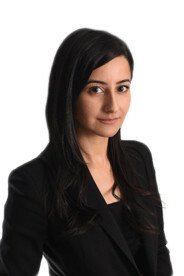 Samantha is regularly retained to act on complex litigations files including subrogated actions involving property and product liability claims, insurance coverage disputes, and property defence claims. In addition, Samantha has extensive experience acting on behalf of both defendants and plaintiffs in personal injury actions arising from slip and fall accidents, motor vehicle collisions, and professional negligence claims. Samantha prides herself in her advocacy skills, a skill that she developed early on in her career through competitive law school moot competitions at both the national and international levels. While Samantha is prepared to go to trial, she recognizes that this may not be appropriate in all cases. Samantha regularly advises her clients on the appropriate use of alternative dispute resolution techniques in order to settle matters outside of the court process. Since 2014, Samantha has served as an executive member on the Ontario Bar Association’s Small Solo Firm and General Practice Section as the Public Liaison Officer. She has chaired continuing professional development programs on behalf of the Ontario Bar Association.